Last June 14, 2013 an alliance of ecpic proportions took place at the Century Seafood Restaurant located at the Ground Floor of the Century Park Hotel on Roxas Boulevard in Malate, Manila. 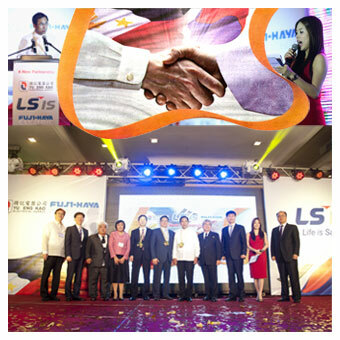 LSIS, the Solutions Company in South Korea, formed a partnership with Yu Eng Kao Electrical Supply and Fuji-Haya Electric; two companies with almost a hundred years of service, providing the best in industrial electrical equipment. With world class ecectrical products, coupled to a legecy of excellence and innovation, the LSIS - Yu Eng Kao - Fuji-Haya union was a milestone for Philippine Power Generation worthy of a great spectacle, ushering in an era where Life is Safe! The event was hosted by TV and Radio Personality Ms. Grace Lee, who is also their new Ambassadress. The night\'s keynote speakers were Mr. Yu HI Kian, President of Fuji-Haya, who gave the introductory remarks while the Secretary of Energy Carlos Jericho L. Petilla, South Korean Ambassador Hyuk Lee and LSIS Vice Chairman & CEO Dr. Ja-Kyun Koo praised the new alliance in their speeches. They all saw the event as a momentous occasion that would bring not just the companies closer but the countries as well. There were other luminaries from business and political sectors in attendance, including: Father Maximo Barbero, SJ, who lead the inovation, former Ambassador Bienvenido Tan, Mr. Cyrano Austria of Alphaland Corp., Peter Mangasing of PESA and London Industrial Products, Inc., Mr. Kenneth Go of Gotesco Mktg. Inc., Mr. Joselito Santos of Ortigas, Ms. Antonette Marquez of Rockwell, Mr. Eun Gap Chang of the Korean Chamber of Commerce, Johwan Choi of the Korea Trade Center, Ms. Ana Siao Ling of Jose Siao Ling and Associates, Mr. and Mrs. Gerry Esquivel of ASEC, Mr. Benjamin K. Calubad of Zenith Electrical & Industrial Supply and Mr. Jimmy Chua of PESA and Jimco Trading. The South Korean Embassy was also represented by Mr. Lim Jae-Hoon while Mr. O.H. Park and Mr. Yong Sang Park represented LSIS. The guest were treated to Traditional Korean Performances, like the Buchaechum or Fan Dance and the Samulnori percussion numbers. More moderm entertainment was provided by acoustic maven Paulo Santos and K-Pop performer Dasuri of G-Force. A raffle that gave out LG applicances was also held. The night culminated wtih an official toast and handshake ceremony presided by Yu Eng Kao Managing Director Hero T. Yu inviting all to pay tribute to a new and prosperous partnership!